Isn’t that interesting… hard to know if things are what they say, isn’t it? Rowans and medlars and barberries have been on my “must try” list. I found the barberries to make an ice cream and hope to get medlar jelly this year… rowans are not so easy but one day! Tasting them is a great deal of fun as it puts a taste-face on what was only a mystery ingredient. I look forward to hearing whether they are the real deal or mis-named! The recipe is lovely and I think I will give it a try with my last prune plums ( not green gage’s I’m afraid!). Thanks for the great research! Yes, all of those things are on my mental exotic ingredient list too. I’ve used dried barberries in a Persian dish, did you find fresh ones? I would also love to get my hands on some sloes so I can make sloe gin. 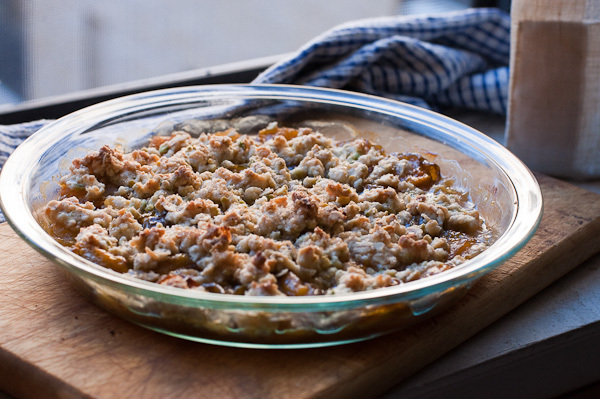 The crumble recipe would work well with any fruit and nut combination and it’s really easy to make. Depending on the sweetness of your fruits you might want to use a different amount of sugar. It’s a great dish for experimentation. I wouldn’t say greengages are well-known here in Britain these days. It’s quite an old-fashioned thing that is more familiar to older generations but it’s not standard supermarket fodder. They do seem to be popping up more as people rediscover traditional foods. Yours look a little more yellow than usual, but still look pretty greengage-y. Thanks for having a look Karen. They were actually greener than in the photo, even with Lightroom I couldn’t quite get the color right. The lighting conditions weren’t so great. 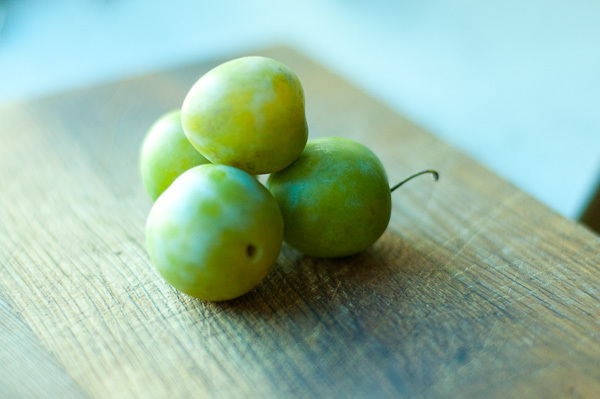 Do you think greengages are less common in the UK because they are difficult to grow and so farmers have switched to other varieties? Hey Kathryn – we were just in France a couple of weeks ago and enjoyed the Reine Claudes – very excited to see them in markets during our visit and the French clearly were thrilled as well, touting the in season plums everywhere. I love green plums. The flesh is translucent and delicately flavored, and the skin lacks that sharp tannic bite of the sweet-tart purples we get here.